Minutes from the A30 we are an ideal central base for touring Devon and Cornwall visiting the Eden Project, the NT properties of Cotehele, Lanhydrock, Buckland Abbey and Saltram, the beautiful moors of Bodmin and Dartmoor and the lovely Tamar Valley. 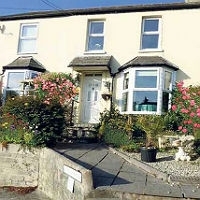 A short 25 minute drive from surf beaches, Tintagel, Boscastle and Bude. Rose Cottage is proud to have been given a 2012-2013 Highly Commended Gold Star Award by the AA for the sixth year running. This confirms our ever growing reputation for comfortable guest accommodation, good food and warm welcome in charming surroundings. We strive to be as eco friendly as possible by recycling, composting, using locally produced ingredients and energy saving policies. We have continued to achieve the Green Acorn Award for our contribution to sustainable tourism. Ideally situated at the junction of the Tamar Valley Discovery Trail and the Two Castles Trail, Rose Cottage provides a warm welcome to Walkers and secure cycle storage for Cyclists, especially the ‘End to Enders’ who find the 4 minute walk to the nearest Inn/Restaurant very convenient. A Luggage Transfer service is available for the convenience of our Walker and Cyclist guests, please discuss your requirements with us.